Holidays are the busiest time of the year for theme parks everywhere, and Florida is no exception to the rule. If one absolutely has to visit during a peak window, then the way to make things bearable is the purchase of whatever fast pass option the park offers. I've never been particularly fond of the concept of paid line jumping, but as time goes on I become more amenable to it, and I've got to admit that the Quick Queue card allowed me to have a good time in the park on a day where every major ride had a wait time exceeding an hour. My first task for the day was to have a look at Air Grover (#1702). There was no restriction on unaccompanied adults enjoying this coaster, despite what the park web page said; the information board at the ride entrance only quoted a minimum height. The ride is a Zierer approximation to the medium sized roller skater; and as such constitutes an enjoyable way to spend a few minutes even if the ride isn't something that one would wait for. Gwazi was upgraded at the start of the year with new Millennium Flyer trains from GCI, and unsurprisingly they're a substantial improvement over the original rolling stock. Both sides of the ride were open today, the first time I've seen that, though they were not being dispatched together for some reason thus eliminating the racing aspect of the ride. Both sides felt much the same to me, despite the layouts being different; perhaps I'm getting jaded. 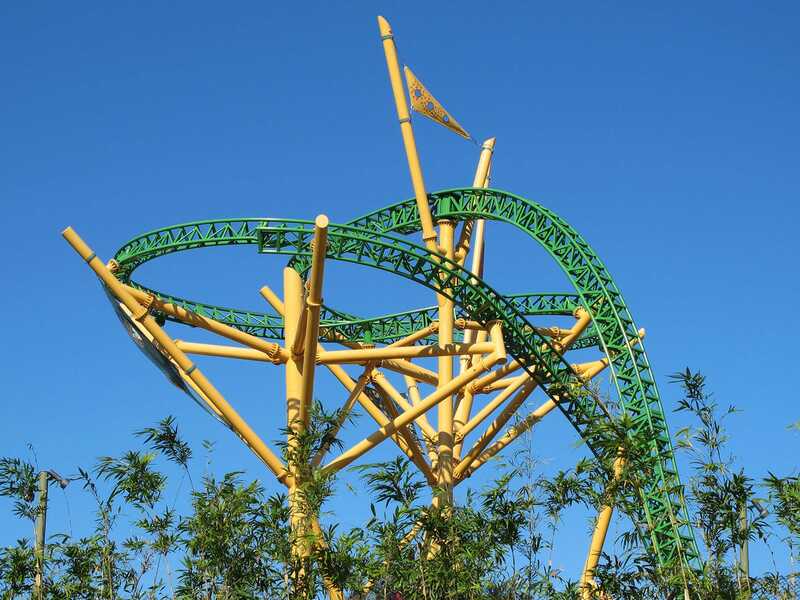 The real reason for my visit today was of course Cheetah Hunt (#1703). This ride has been described by some enthusiasts as an extreme family coaster, and that's exactly the right definition for a ride that has three launches, airtime, speed, and forces while all the time remaining low to the ground (other than for the tower at the start of the ride). It was good enough for me to invest two hours of my life queueing up for a second ride, which if anything was better than the first. Personally I think that Busch have bought a coaster that is pretty close to perfect; the only thing that I don't like is the over-the-shoulder restraints; if the trains had lap bars then it'd be in my top ten. After a meal break, I took a trip on Rhino Rally. This ride is now a shadow of it's former self, as the water section is no more, the land having become part of Cheetah Hunt. The driver tried to make up for it by telling goofy jokes, the best of which (yes, really) was What age do elephants live to? Until they die. On disembarking, he advised us to enjoy the rest of our day at Sea World; I wonder if this is the planned script or if the driver was just branching out a bit. Answers on a postcard please. I finished my day with one lap on each of the three B&M coasters; Kumba, Montu, and Sheikra. I'd have liked to have ridden Scorpion but the wait was over an hour and my Quick Queue didn't cover it; perhaps next time.